conversation about who will be eligible for “scholarships” and how much we will give to each person/member/student. This discussion can be ongoing, but it may very well affect our grant-writing, which is immediate. A big THANK YOU to Cherie Roshau for printing our entry forms for the 2015 Fall Show. The next meeting will be Monday, September 14 at Dunn Brothers Coffee, Dickinson. 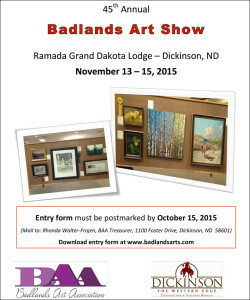 The Badlands Art Association’s Fall Show is going to morph into “The BAAKEN Art Show” – or some such. 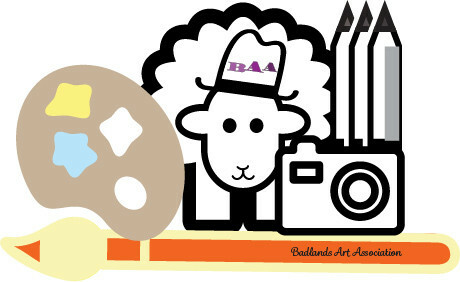 A play on BAA (our organization’s initials). Stay tuned! We are going to have FUN with this! We’re baa-aak and better then ever! Next meeting is MONDAY, AUGUST 3, 2015 at 6:00 pm at Dunn Brothers Coffee in north Dickinson. Here.